Juan Guaidó, the president of the National Assembly, as he swore himself in as the acting president of Venezuela at a protest in Caracas on January 23, 2019. Photo by Efecto Cucuyo, used with permission. Every January 23, Venezuela marks the anniversary of the coup d’état that ended Marcos Pérez Jiménez's military regime in 1958, in what is commonly known as “the return to democracy”. Sixty-one years later, thousands of Venezuelans who oppose the government of Nicolás Maduro are taking to the streets hoping the winds will blow the same way. As we write this story, people are gathering in large numbers in major cities like Maracaibo, Barquisimeto, and the capital Caracas, as well as smaller towns. The rallies were called by Juan Guaidó, the new president of the country's opposition-controlled National Assembly, who earlier this month publicly denounced Maduro's legitimacy and proposed to invoke an article of the 1999 constitution that would install a transitional government with Guaidó as president. 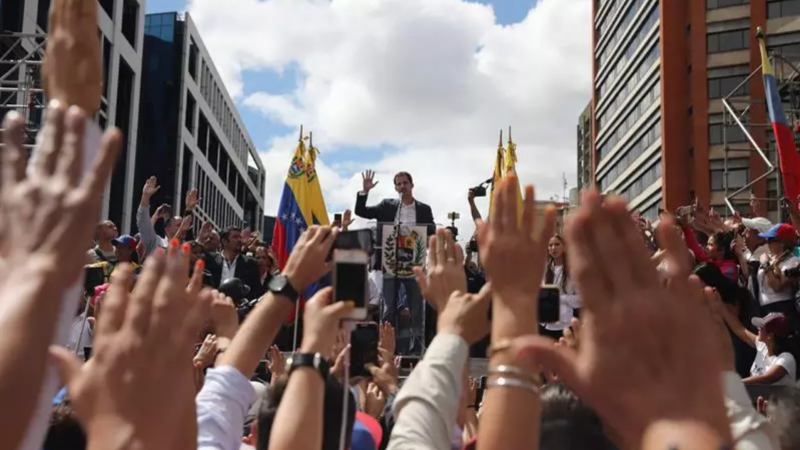 Speaking at a protest in Caracas this afternoon, Guaidó swore himself in as the acting president of Venezuela. Soon thereafter, the United States’ president Donald Trump publicly recognized Guaidó as the country's legitimate ruler, with most governments in the region — such as Canada, Argentina, Brazil and Ecuador — as well as the Organization of American States, following suit (notable exceptions were Mexico and Bolivia). On the day before, January 22, the United States’ vice president Mike Pence posted a Spanish-subtitled video on Twitter and YouTube in which he directly addressed the Venezuelan people, calling Maduro a “dictator with no legitimate claim to power.” Maduro responded by breaking diplomatic relations with the United States. Today's events are likely the toughest challenge ever faced by Nicolás Maduro, whose popularity has been shrinking briskly in recent years in the face of economic collapse, food shortages and soaring urban violence in the country. The last time such massive protests threatened his administration was in 2017, after he effectively nullified the powers of the National Assembly. Maduro survived that revolt, which left around 163 dead over the course of several months, and went on to be sworn in for a second six-year term on January 10, 2019, following an internationally condemned snap election in which opposition parties were barred from running. Since earlier this month, opposition leaders have been organizing small protests in different areas of Caracas, including in traditional bastions of chavismo. On January 22, a small squad from the Bolivarian National Guard declared themselves in rebellion against the government. The army quickly managed to quell the mutiny, but for the opposition their move sparked hope, as the military is a critical actor in Venezuelan politics and unmistakably the backbone of Maduro's government. Four people have been killed so far in today's protests, according to independent website Efecto Cucuyo. Police have responded with tear gas and rubber bullets in parts of the Caracas, according to reports from Caroata Digital, another independent outlet, and Provea, a local human rights organization. Government supporters have staged much smaller demonstrations in parts of the country, while some have taken to social media with hashtags such as “The streets belong to chavismo” (#LasCallesSonDelChavismo). But both sides have been using hashtags taken from passages of Venezuela's national anthem: “Let’s shout with verve” (#GritemosConBrío); “Down with the chains” (#AbajoCadenas). The outcome of the protests remains to be seen. While the opposition has arguably received its most significant vote of confidence from international leaders since the National Assembly's election in 2015, the military has shown very few signs of breaking with Maduro. On social media, many have noted the significance of today's date. The video below reproduces an extract of the speech given by Romulo Betancourt, the former president who returned from exile after the fall of Jiménez on January 23, 1958, and would go on to be president of the country from 1959 to 1964. In his speech, Betancourt called for national unity and defence of democracy.